So Air Asia is having their famous free seat promotion. And because of this too, I've burned not a hole in my pocket, but my bank too T____T. Alrite before we all get too excited, this trip might be cancelled last minute because...I might be involved in extra class for mid year school holiday. Yerpppp! 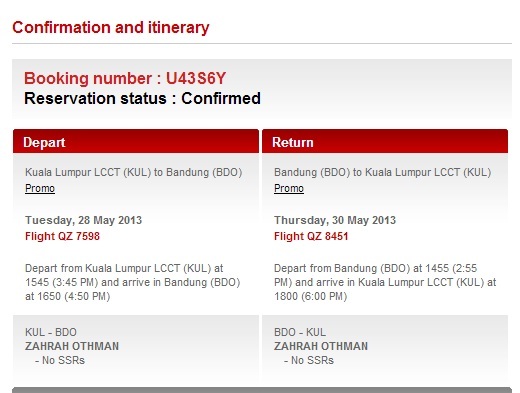 I took the risk of buying it because for 2 pax return tickets to Bandung I spent ONLY RM190! yess that cheap. So one person about RM95. If let say the extra class is on, Bye bye Bandung. Hello Form 3 kids! (I'll be teaching Form 3 next year). And I also bought another return ticket for Mom =))))). She has been asking me to accompany her to Bandung since forever. I felt guilty for it so I bought one for her. 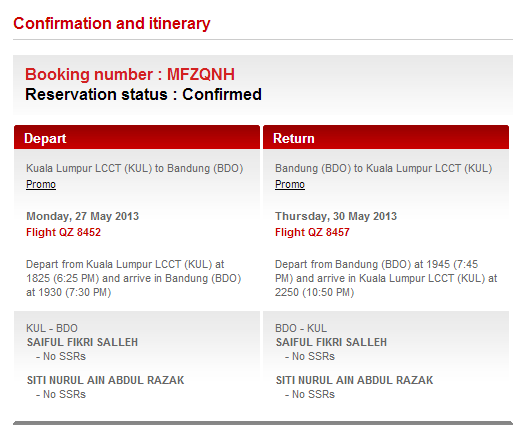 Cant wait to go Jalan2 with mom. yippeee! Mom will arrive a day later than us. I bought her later that afternoon and when I checked, the price already went up to RM233 one way. So I bought her the following day which was RM30 onleyhhhhh. If the trip is confirmed, and if I have extra rezeki, I will buy a new ticket for her so that she will travel on the same flight with us. =)) InsyaAllah.